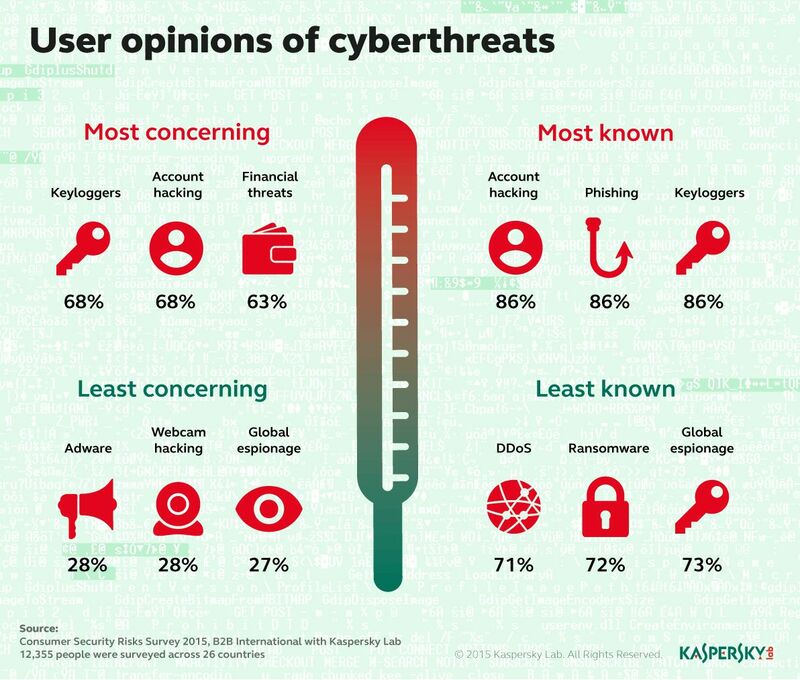 Kaspersky Lab and B2B International have conducted a survey to find out which cyberthreats Internet users are aware of and which they fear the most. It turns out that theft of online accounts is the biggest concern for users. Hacking of accounts and malware designed to steal passwords and confidential information were cited as the biggest concerns, with approximately the same number worried about these two threats (both 68%). Financial threats came third with 63% concerned about possibly losing money from an account, followed by phishing emails and websites. Yet another threat targeting account credentials landed in fourth place. Threats designed to steal credentials were also among those that users are most familiar with. 86% of respondents are aware of account hacking, phishing and malware that intercepts passwords. This shows that the best known and most worrying online threat for users is the theft of their digital identity. The threats that worry users the least are DDoS attacks and global espionage campaigns. This may be because these types of cyberattacks primarily target companies and rarely threaten ordinary users. Unsurprisingly, DDoS and espionage campaigns are the threats that users are least familiar with. However, 29% and 27% of respondents, respectively, have not heard about them. One alarming result highlighted by the survey is the fact that 28% of users are ignorant of the ransomware threat. This is at a time when new malicious programs that encrypt files on computers and demand payment for a decryption key are emerging more and more frequently. Kaspersky Lab experts, for example, recently reported a new modification of the Tesla Crypt Trojan that demanded $500 (more than PhP20,000) from each victim. Adware and malicious apps, created to access webcams, lead the way among the threats users are aware of but which cause no concern. However, these programs are more dangerous than they seem. Cybercriminals can watch users or overhear confidential information via a webcam, or use video clips to blackmail their victims, while advertising modules can be utilized to imbed even more dangerous programs. So, the survey shows that users still underestimate many cyberthreats. Interestingly, 54% of respondents note a significant increase in the number of online threats, but only 23% of them believe they could be targeted by a cyberattack. "People are concerned about the safety of their online accounts, although in reality few of them think they will be targeted by a cyberattack. And that’s where they’re wrong! Attackers often rely on the element of surprise, when users least expect it. That’s why Kaspersky Lab recommends Internet users to expand their knowledge of current Internet threats, to be alert and make sure their security solutions are primed and ready," said Elena Kharchenko, Head of Consumer Product Management, Kaspersky Lab. Kaspersky Internet Security – Multi-Device and Kaspersky Total Security – Multi-Device are universal security solutions that protect home computer and mobile users from known and unknown threats. The products integrate technologies to protect device owners from malware, including software designed to intercept passwords for online services, from financial threats, phishing, adware and more. The component for Windows-based devices also incorporates a mechanism to protect from unauthorized access to the web camera and microphone.